summary: A tough three day hike which takes you into some amazing parts of the Megalong Valley and back to Katoomba via Dunphys Campsite and Narrow Neck. Departing from Wollongong, head for The Blue Mountains via Narellan and Penrith (160kms, 2hours). Departing from Sydney, use the Western freeway from the City heading west (100kms, 1 hour 45 minutes). 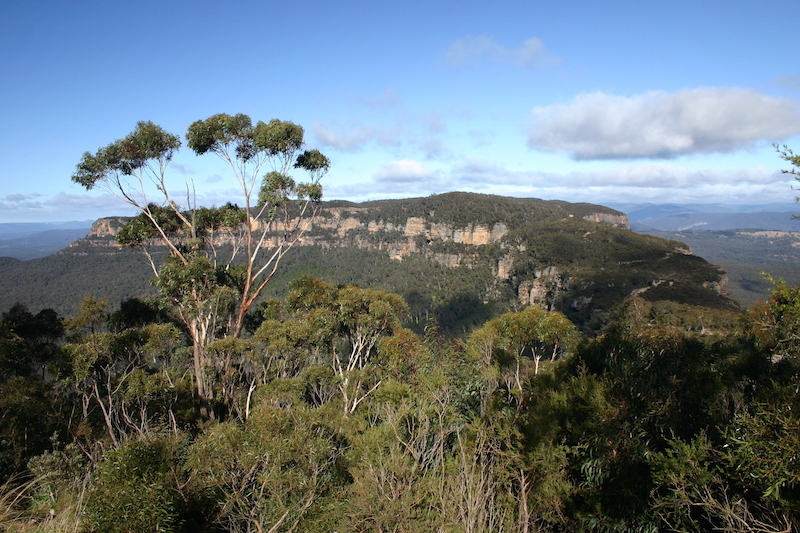 The hike begins at the head of the Six Foot track which is just a little west of Katoomba. You may want to do a car shuffle with your hiking buddies if you dont want to add three kms of road walking to the end of your trip, which finishes up at Scenic World near Katoomba. The hike starts by following the Six Foot track away from the car park down the hill along the Nellies Glen trail. Soon enough, the track walking closes in and you are on a walkers only trail which then starts to descend into the valley bellow. Continue to follow the Six Foot track past Bonnie Doon Falls, across Devils Hole Creek and Diamond Creek and oast the old Megalong Village site. Continue along the Six Foot track across Corral Creek to an intersection where you veer right keeping the power lines to your right. The track then cross a fence and continues on to cross the Megalong Creek. The track then navigates alongside some private property so make sure to take note of the signs and the property line. You will then cross the McLellan bridge and a sealed road which heads towards Jenolan Caves. Keep following the Six Foot track signs past the Megalong Cemetery which is worth spending a few minutes at. Continue downhill following the signs and some more private land which indicates that no camping is allowed until you reach the Coxs River. There are a few gates that you will pass through here before reaching the Bowtells Bridge which is a suspension bridge for use when the river is too high to cross at ground level. After crossing the bridge, follow the steps up through the forest for another km or so before you see the signs for the Coxs River Campground which is where camp will be for tonight. 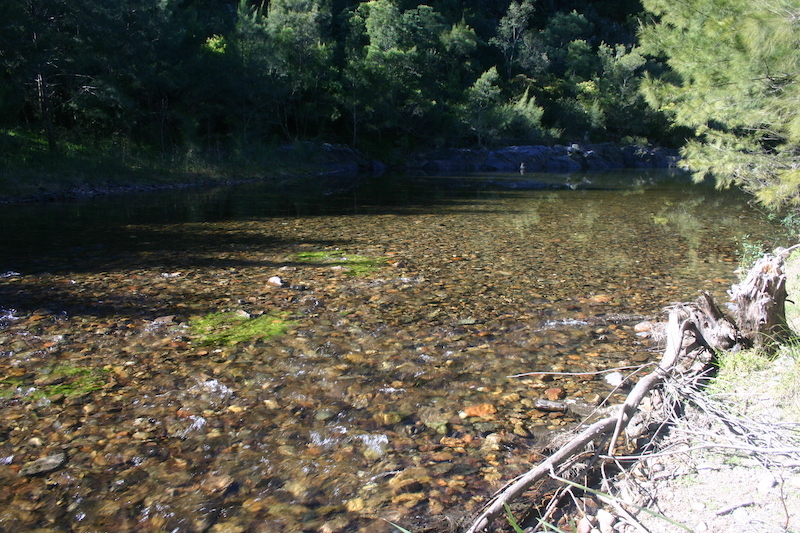 Todays walk takes us from our Camp site at the Coxs river, through the river valleys to Dunphys camp site. Start in the morning by walking down to the sandy banks of the Coxs river and crossing over to the other side. Then head south east along the side of the river through the farm land, avoiding the cows and horses. Stick to the river as close as possible to avoid crossing into private land. Continue following the river as much as possible, some crossing sides is required. You will notice numerous camp sites along the banks as you get closer to the intersection with Breakfast Creek. Once you have reached Breakfast Creek, start following it to the east up river. Once again there will be numerous crossing of the creek, but hopefully the levels are down so your feet will stay relatively dry. We take a turn to the north once we get to Carlons Creek which takes us towards Dunphys camp. The track slowly turns up hill however so the rest of the day will be a hard slog until you reach the safety and comfort of Dunphys campsite. Hopefully you got a good nights sleep, and your legs are feeling strong because today is going to be all up hill. Or at least some very steep sections before we get to the plateau of Narrow Neck on the home stretch. Leave Dunphys camp site following signs towards the Bellbird Ridge track. The track is will marked and easy to follow passing a "Bellbird Point 1.5km" sign before another one indicating the Medlow Gap management trail. From this sign, continue to the north east under the power lines before turning to the east and taking you straight up the steep hill until you reach the first of several cliff faces. Follow the cliff around to the north until you find a small climbing chimney adorned with metal pegs and chains to help with the climb. Take your time climbing up here as it can be dangerous. This is Carlon Head Pass. 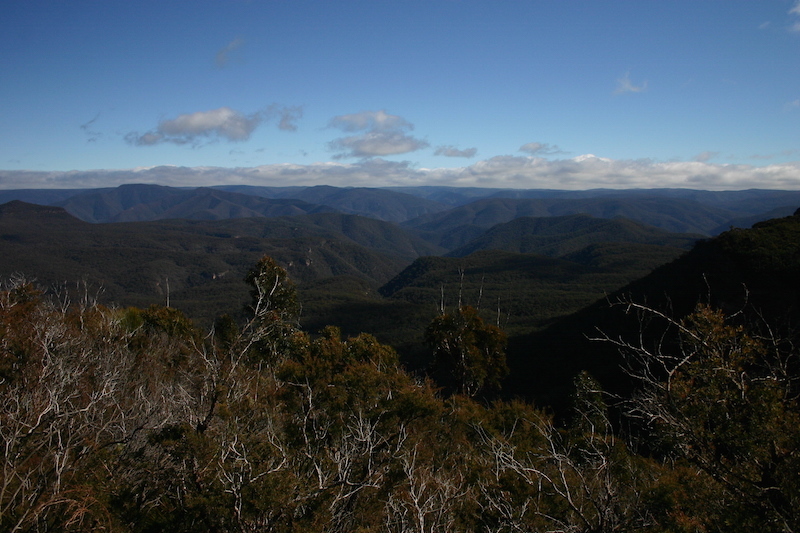 After taking in the views from the top of the pass, continue along the rough track to the east towards the fire tower on Bushwalkers Hill where you will find some toilets. 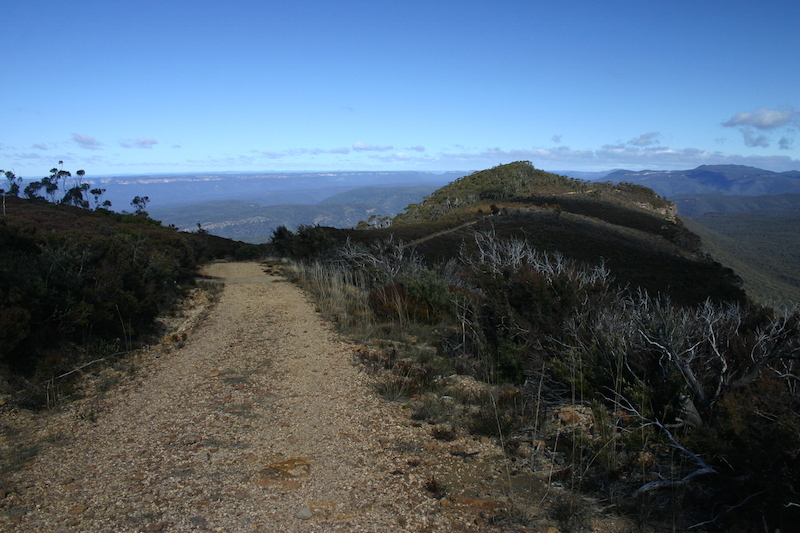 From Bushwalkers hill, turn to the north and follow the trail along Narrow Neck. This track will take you all the way back to Cliff Road just a few hundred meters from Scenic World. Download GPX data for WAYPOINTS.